Brooks Camp is located in the heart of Katmai National Park, Alaska. Long famous for its world-class fishing, spectacular volcanic and geologic features and beautiful countryside, Brooks Camp is now widely known for its remarkable bear viewing. 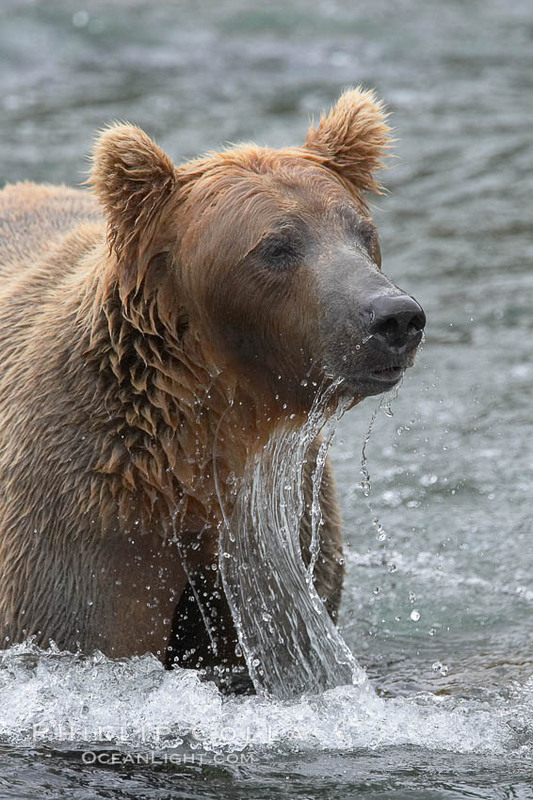 Each July, during the height of the salmon run upriver, and again in September when the “spawned-out” salmon return downriver, dozens of brown bears (grizzly bears, Ursus arctos) congregate in the Brooks River, its surrounding forests and meadows, and along the shores of Brooks Lake and Naknek Lake to feast on the salmon. 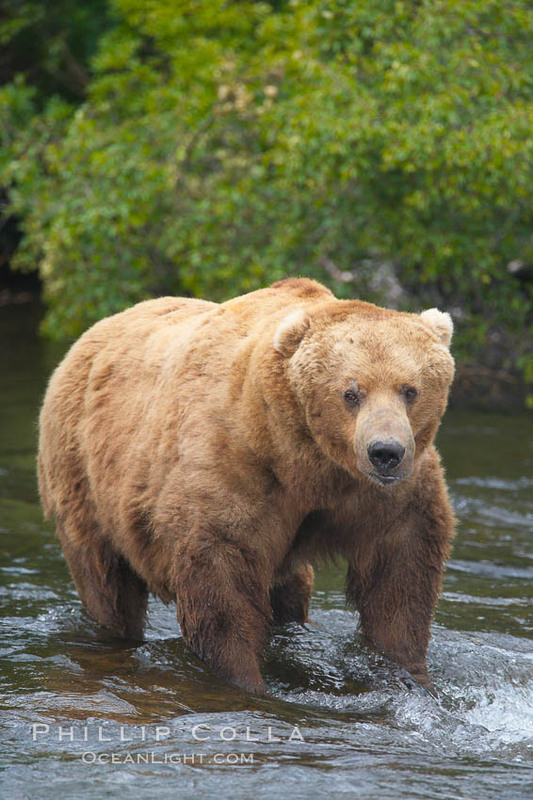 Brooks Camp is one of the finest places in the world to view wild brown bears. I spent a week at Brooks Camp in July 2006 with Keith Grundy and his wife and two sons. 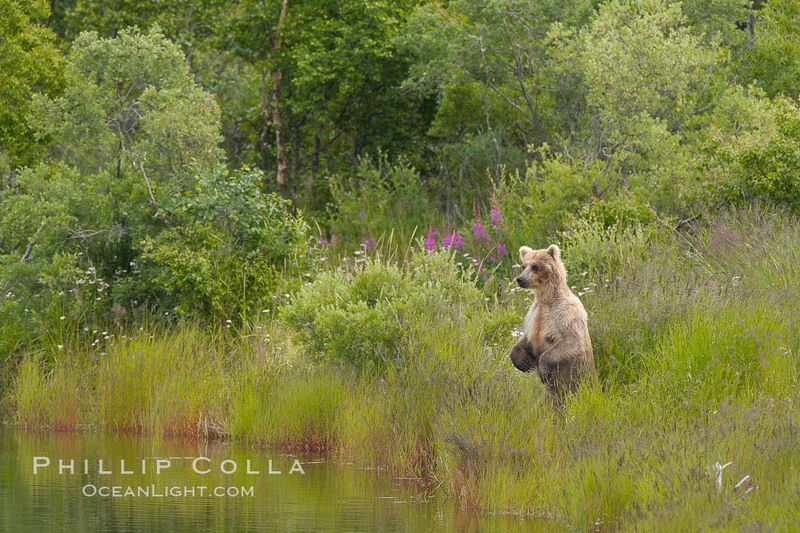 We had a great time watching and photographing the bears, walking around the woods and wondering if we would stumble across one of Timothy Treadwell‘s favorites, and just enjoying this wonderful Alaska setting. We even awoke one morning to a bat buzzing around inside our cabin room, that was cool, four men hiding under their covers from a 4-oz. flying vampiric squirrel. Arrangements. We made arrangements to stay at Brooks Lodge, which included flights from Anchorage to King Salmon (by turboprop) and King Salmon on to Brooks Camp (by float plane) through Katmailand, the concessionaire operating Brooks Lodge. In particular, the float plane rides are really fun. The Katmailand folks were pleasant to deal with. Since stays at Brooks Lodge during the prime bear viewing weeks are limited to three nights, and I wanted additional time there, I made further arrangements to stay in the campground at Brooks Camp through the National Park Service. Brooks Lodge may seem expensive but it isn’t by Alaskan lodge standards, and the campground is dirt cheap. There are many tour companies and individual tour group organizers that will get you to Brooks Lodge for a multi-night stay, or just to Brooks Camp for the day. Many of these tours will offer some sort of photography instruction. You will pay a bit of a premium for this, but many visitors feel its worth it as the tour groups I encountered there were full and quite satisfied. I remember Natural Habitat had a group there, and I spoke with their tour guide a few times, and it seemed like a top-notch operation. I rarely join tour groups, preferring to have more control over my itinerary and spend less money by making my own arrangements. If you do too then Brooks Camp will be straightforward for you to arrange on your own. If you are pursuing photography, I definitely recommend that you stay at Brooks Camp, either in the lodge or campground, rather than visiting for the day by float plane, since you will forego precious morning and evening photography opportunites if you choose to visit only for the day. Brooks Camp. Visitors to the Brooks Camp area, after arriving by float plane, walk to Brooks Lodge and the ranger station to check in (if staying overnight) and to receive a brief, manditory lesson on how to behave around brown bears, especially when hiking or camping in the area and particularly when handling food or scented gear. Brooks Lodge itself is relatively small and simple, offering a fireplace and comfortable sitting chairs for relaxing and a dining room with simple yet satisfying buffet-style breakfast, lunch and dinner. I particularly took advantage of the bar at the end of the day, toasting my good fortune to be in such a great place before retiring for the evening. Cabins at the Lodge are spread over several acres, are spartan but comfortable, and offer bunk-style sleeping arrangements for a maximum of four per cabin. I am told the lodge manager tries to organize guests in such a way as to leave at least one bunk empty in each cabin but it may not be possible in July, especially for single travellers or odd-sized groups. The campground, an inexpensive alternative to the lodge, is a half-mile walk from the lodge on the shore of Naknek Lake. An electric “fence”, which looks like two lines of bungy cord with an electric conductor woven in each, is stretched around the perimeter of the campground. I camped in the center of the campground to ensure that any hungry bears that were not put off by a little shock would encounter someone else’s tent before mine. Some campers brought cooking gear with them and made fires and all that stuff each night. I choose instead to go light, relying on the lodge for meals and the lodge’s bar for entertainment, bringing only a tent, sleeping bag and some beef jerky. The Experience. Brooks Camp is about bear viewing, salmon fishing and visiting the nearby and spectacular Valley of 10,000 Smokes. Brooks Camp is a simple, no frills place. During my brief week-long stay I experienced weather ranging from warm, blue sky days with pleasant breezes to overcast days so windy the day-visitor float planes could not land on Naknek Lake, to cold and rainy weather. I did not experience much of a problem with mosquitoes, gnats or other bugs, although you are well advised to prepare for that anywhere in Alaska. You will NOT be alone at Brooks Camp in July, unless you choose to go hiking. Most visitors to the lodge and campground during that time are there to see bears and/or go fishing, so if you are too then you will see one another at meals in the lodge and out on the trails to and from the places where the bears gather or the fishing takes place. However, in mid-summer the days are long and, if you rise and leave the lodge/campground areas early in the morning, you can find solitude easily enough. There are no distractions from television, radio or any of that crap offered at the Brooks Lodge, which is great and helps one to reset the mindset and really absorb the smells and sights that the lakes, river, meadows and forest have to offer. Your cell phone won’t work but your satellite phone will. It should be noted that it is stupid to hike there with an iPod jammed in your earholes, for obvious reasons. Also, leave your computer at home. Don’t bring the damn thing to Brooks Camp, its just plain wrong not to mention tasteless, we must maintain some limits on technology in the outdoors. Brooks Falls. Once visitors have been briefed on the bears and checked in to the lodge or campground, it’s off to the falls … Brooks Falls that is. Brooks Falls, roughly midway on the Brooks River between Brooks Lake and Naknek Lake, is the most popular spot in the Brooks Camp area for viewing bears, and with good reason. It is at Brooks Falls that salmon swimming upriver must navigate their only significant vertical challenge on their way to spawn in Brooks Lake. 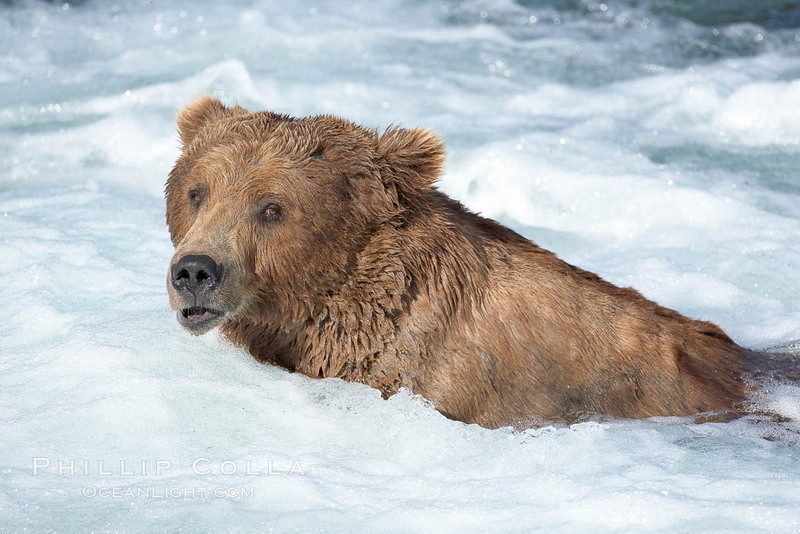 And it is at Brooks Falls that brown bears wait, both below and above the falls, to catch and eat the salmon. 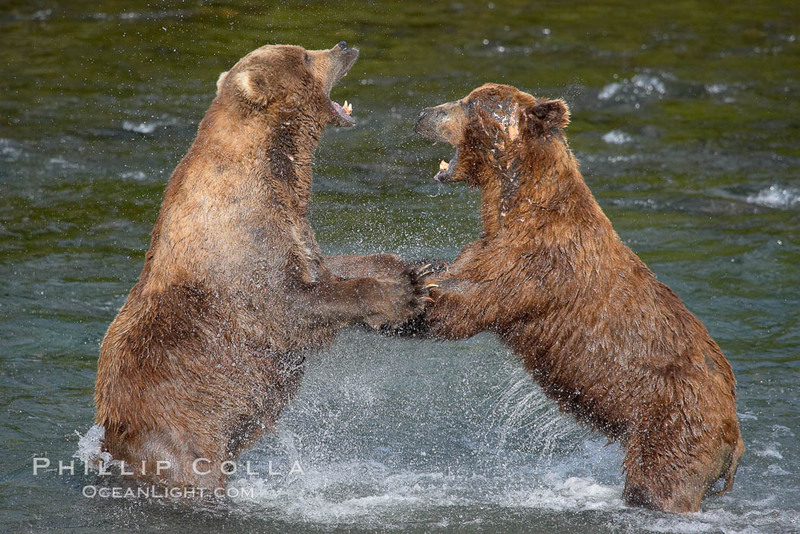 I spent six full days and two partial days at Brooks Camp, and allocated 3-7 hours each day to being at the falls, just to enjoy the show and try to shoot some photographs of the bears catching the salmon in midair and ripping them apart sashimi-style. The National Park Service has built an enormous, sturdy 10-foot elevated boardwalk, originating in the woods about 150 yards from the falls, and ending in two large viewing platforms where visitors can hang out and watch the bears in safety and without distracting them from their feeding, resting needs and socialization. The first platform overlooks the Riffles, a stretch of the very mild rapids about 100 yard below the falls. If a group of bears is occupying the falls, some of the smaller or less aggressive bears may move down into the Riffles stretch to fish. 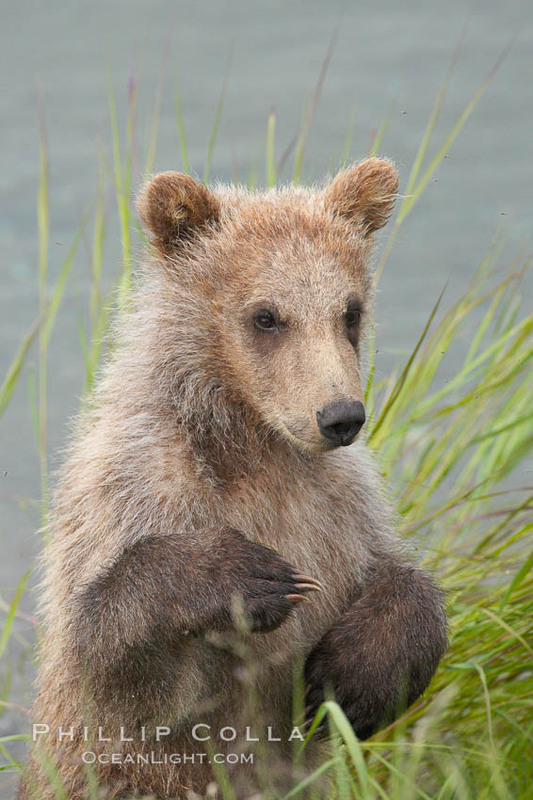 We found the Riffles was the best place to observe mothers and cubs and yearling bears, since it was dangerous for these younger bears to spend time around the large males (who might kill them). The Riffles platform tended to be the less crowded of the two platforms, by far, and on occasion actually offered the better opportunities for viewing — it all depends on the vagueries of the bears and the numbers of salmon passing through on any given day. Falls Platform. The primary viewing platform is the Falls Platform, naturally situated alongside Brooks Falls itself. 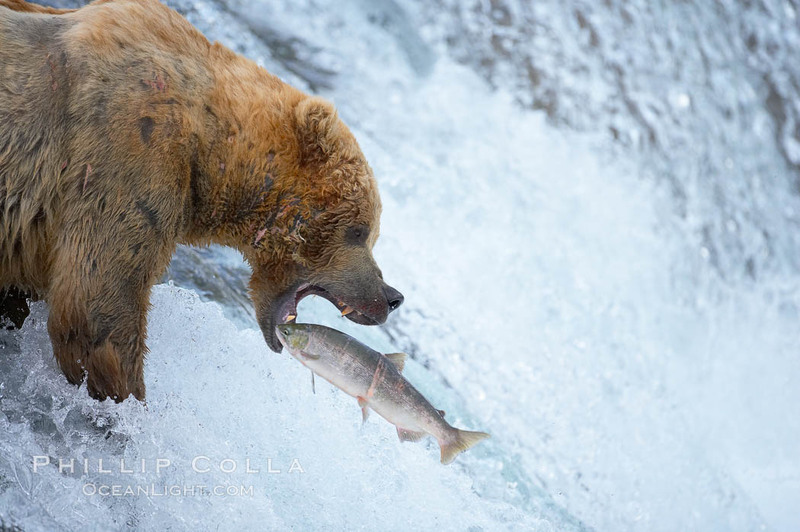 This is the best place in the world to capture the classic bear catching salmon photograph, such as the one made famous by the superb photographer Thomas Mangelsen. 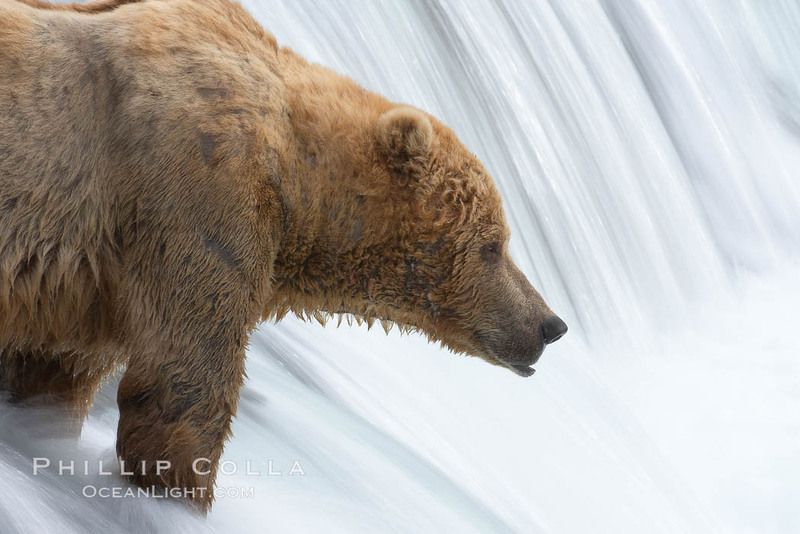 All you need is a bear or two atop the falls, a school of salmon moving through with individuals periodically attempting to leap up the falls, and a quick trigger finger on the camera. I managed to get a few shots of this myself, and look forward to trying it again sometime. It should be noted that the Falls Platform can get crowded, to the point where the park service will institute a waiting list and limit stays on the platform to an hour per person. I had heard horror stories about visitors being very frustrated by crowds at the Falls Platform and not feeling that they were able to spend enough time there, so I deliberately scheduled twice as many days at Brooks Camp as I thought I would need to account for this possibility. 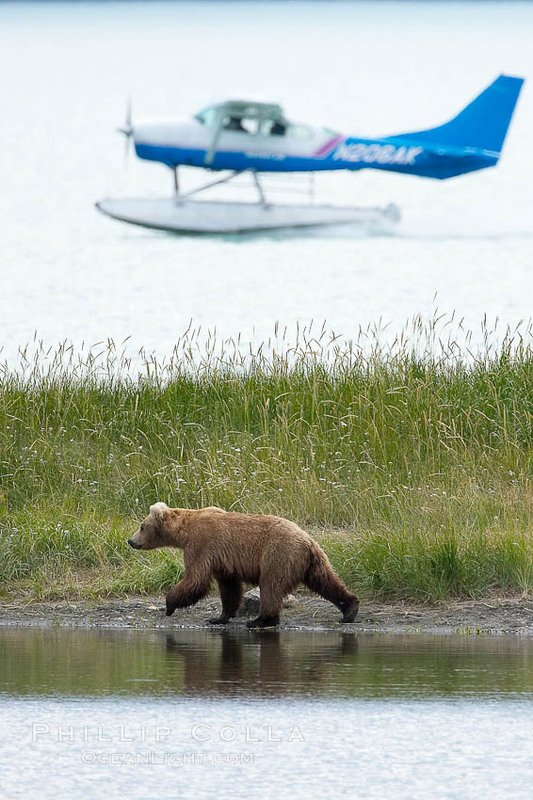 In my experience the crowds were not a great problem, and I only observed a waiting list in the afternoons, when day visitors (those who fly in by float plane to view bears and fly out again the same day) were present. By about 6pm all day visitors have left, and the crowds are no longer an issue. I found that there was plenty of light for viewing bears at the falls and shooting photos until at least 8pm in the evening unless it was really overcast or raining, and as a consequence I returned home with many more frames that I expected. I found that, on a full frame camera (Canon 1DsII) that a 500mm f/4 was my most used lens, followed by 100-400mm and 70-200mm lenses. I think a 600mm lens would have been too limiting, although I did see a few guys using them, perhaps framing up tight portrait shots. I think I broke out a 24-70mm lens just once on the platform. Etiquette. It should be mentioned that there is some etiquette required for the platforms, particularly the Falls Platform, for photographers. The platform is well suited for 40-50 visitors but is standing room only. Once photographers, with their bulky tripods and ginormous telephoto lenses, start occupying spots on the platform it starts feeling crowded in a hurry. It is important for photographers to remember that, regardless of how awesome their gear is or how much money their tour group cost, they are no more entitled to a spot on the platform than Aunt Bessie from Wisconsin with her point-and-shoot instamatic. Indeed, for Aunt Bessie, time spent on the platform is likely even more of a thrill than it is for the travel-hardened, experienced photographer. Photographers, go ahead and spend time on the front row of the platform — for you will naturally weasel your way up there, you’ll see — and then voluntarily back off and allow others (especially kids) to have your spot, even if they care nothing for photos. You will find that shooting from the rear of the platform will give you somewhat different angles on the bears on the falls. I know, its hard to do, and I was as tempted as any other photographer to hog the front of the platform with my megacamera setup, but I realized moving around and shooting from the back of the platform actually allowed me to shot compositions I would have missed up front. I found during my stay that, in spite of afternoon waiting lists at the Falls Platform, everyone on the platforms was quite polite and pleasant — indeed very happy just to be in such a wonderful place. Even the most serious photographers eventually smiled and gave up their prime shooting spots for others who had been waiting a while. Only one notable incident involving platform crowding took place while I was there, on the Riffles platform. One of the National Park Service rangers, who pursues photography (apparently professionally) as well, was off-duty and shooting from the rear of the empty Riffles platform as a group of others, myself included, arrived. He asked us to stay out of his line of sight, stating that since he was shooting with a prime (fixed focal length) lens he did not have freedom to move from his position at the rear of the platform for his chosen composition. This request effectively made the entire platform inaccessible to the rest of us, until he was finished with his shot. Now, while his request would have been reasonable in a situation where everyone had reasonable freedom of movement, on the platform such a request was ridiculous, especially so coming from a ranger who we assume spends weeks, if not seasons, at Brooks Camp. We allowed him to have a few more minutes to his shot, but since his request kept the rest of the visitors from even using the platform we eventually had to tell him so and step on to the platform so that we could have a look at the bears ourselves. The moral of the story, which this experienced ranger certainly must have known, is: bring a zoom when shooting from the platforms. This is stating the obvious: you are on a platform with limited ability to move about. While primes are sharper and faster, on a platform you may (will) find yourself constrained in ways that only a zoom can solve. Bridge. The platforms are on the opposite side of the Brooks River from the lodge and campground. A floating bridge exists, near the mouth of the Brooks River at Naknek Lake. A raised platform has been built on one side of the bridge which is a great spot for viewing bears in the surrounding meadow and along the banks of the Brooks River. The bridge is a natural pinch point, since anyone staying at the lodge or campground really must cross the bridge during the course of a typical day of bear viewing. Therein lies the rub. If a bear is hanging around either end of the bridge, or has chosen to lay down for a nap near the bridge, the rangers may close the bridge until the bear has left, a closure that could last for hours resulting in the famous Brooks Camp “bear jam”. Bears have right of way through the park, and visitors are limited in how close to a bear they may be. Bear jams can occur anywhere in the park that a narrowing exists (road, trail, bridge, etc.). Since the brush underneath the bridge platform happens to be a natural place for bears to bed down (especially sows with cubs), bear jams at the bridge occur fairly often. I was lucky and not subjected to any that lasted more than a few minutes. Anyone with a flight out of Brooks Camp is advised to factor the possibility of a bear jam into their schedule and return early to the camp so as not to miss their flight. On our final day at Brooks, we were in a sense beneficiaries of a long bear jam. We hit the trail immediately after breakfast and spent the entire morning on the Falls Platform. For several hours the platform was nearly empty and very quiet with just a small group of us there, and we felt as if we had the falls to ourselves, a rarity in July. We all had lots of space to move about the platform. Just as we were leaving, many more people began to arrive — people who had been held up at the bridge for nearly the entire morning due to a napping bear, one we had missed by just a few minutes on our way out after breakfast.